Sage Studio is proud to collaborate with Raue Center and Williams Street Rep on our brand-new production program, Sage on Stage! Students will spend two weeks honing their musical theatre skills and learning all about the “behind the scenes” of what goes into a mainstage Raue Center show–while working right alongside our cast of professional Chicagoland actors. 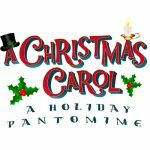 Students will get to build on all the great performance fundamentals we teach in the classroom, then put those skills into practice for an audience as part of the youth cast for our very own full-scale production of A CHRISTMAS CAROL on the Raue Center stage! REGISTRATION FOR THIS WORKSHOP IS NOW SOLD OUT! Email us at education@rauecenter.org to be added to our waitlist. Registration is still open for our January Sage Studio classes. Click here to learn more! *If unable to attend this date, please email education@rauecenter.org for an alternate audition. Materials will be provided. Your registration fee includes two complimentary tickets to the show of your choice, with additional tickets available for purchase for friends and family. To Book your complimentary tickets, you must call the Box Office at (815) 356-9212. **Financial aid available–contact Caitlin at education@rauecenter.org! *Rehearsal conflicts must be disclosed before placement auditions. Show conflicts will not be accepted. Registration is open for current Sage Studio students and will open for public on October 31st. Prerequisites: Students must have attended at least ONE Sage Studio class in the past year, or be registered for an upcoming class, or present equivalent theatre experience. *If presenting equivalent experience, please email a resume to education@rauecenter.org prior to registering. Students should also be available for all performance dates and tech rehearsals (see Timeline section). To be considered for a larger speaking role, students must be available for the full rehearsal period; smaller roles are available for those with conflicts, but students should be available for the majority of the rehearsal period. If you have specific questions contact us at education@rauecenter.org. All registered students registered in this section will be part of the show! We will hold a placement audition on Wednesday, Nov. 14 at 6:30 PM to determine individual role assignments for those interested in solo speaking/singing lines–but if your student only wants a role without solos, just let us know by emailing us at education@rauecenter.org. Everyone will have a special part to play in this interactive theatrical experience! FAMILY DISCOUNT: Multiple students from the same family can qualify for our multi-child discount of $150 for the first child and $50 for each additional child. This can be used on any level of Sage Studio class! Available online and only after registration of first child. PLEASE NOTE: Upon completing registration, you will NOT receive a confirmation email. If additional information is needed OR if the class you are attempting to register for is sold out, you will be contacted by Sage staff as soon as possible. Payment is due at time of registration. Registration won’t be complete and a spot will not be reserved without full payment. REFUND POLICY: In the event that your child cannot participate in the class after you have registered, Raue Center will issue a refund of your registration fee less 25% up to two weeks before the start date. After this time period, if your child cannot participate in the class we will refund you less 25% in Sage Bucks, which are redeemable for any upcoming Sage class within a year of cancellation, or can be used at Raue Center for tickets to WSRep, etc. (restrictions may apply). Families must designate usage of bucks within 30 days of notification of cancellation. Restrictions may apply. Financial aid is available for ALL Sage classes! Contact Caitlin Quinn at education@rauecenter.org for more information!